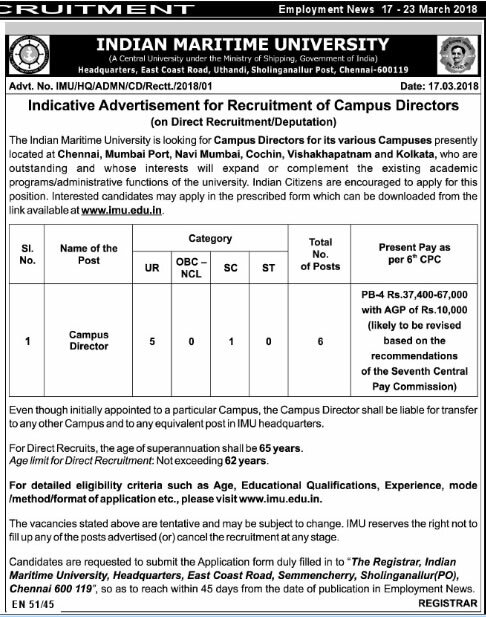 Indian Maritime University (IMU) Chennai has published recruitment advertisement for Teaching (Faculty) posts in various schools in IMU under Direct Recruitment. The Online registration of application will be open from 1st August 2018 and close on 30th August 2018. (1) Ph.D Degree in relevant discipline. (2) Good academic record with at least 55% marks or an equivalent grade at both UG and PG level or at integrated PG Level in a relevant discipline. (3) A Minimum of 10 years (Professor) / 08 years (Associate Professor) of teaching / research / industry experience. How to Apply: Interested and eligible candidates may apply online through IMU Website. The online registration of application will be start from 01/08/2018 at 11:00 Hours and close on 30/08/2018 up to 23:59 Hours. Indian Maritime University (IMU) (A Central University, Government of India), Mumbai Port Campus, Mumbai invites candidates for a walk-in Interview for the post of Faculty, Medical Officer and Instructor on Contract Basis for 6 months initially (liable to be extended as per requirement and subject to satisfactory performance). The last date for submission of applications is 27th July 2018. Master (FG) Certificate of Competency; Sailing experience for a minimum period of Six months at Management level within the meaning of STCW Convention in force. MEO Class I (Motor) Certificate of Competency; Sailing experience for a minimum period of Six months at Management level within the meaning of STCW Convention in force. M.E./ M.Tech (Electrical & Electronics / Instrumentation / Power Electronics) with teaching experience at Degree level (preferred area of specialization - Electrical Machines / Controls and Instrumentation. M.E/ M.Tech (Mechanical) with teaching experience at Degree level (preferred area of specialization - Machines/Mechanics/Applied Thermal Engg. / Control Engg. / Fluid Mechanics or Material Science). Recognised Medical Degree (MBBS) of any University and Registered with the Indian Medical Council and completion of compulsory rotating internship. Diploma (Mechanical Engg./ Marine Engg.). Experience in relevant trade; preferably that of Black Smithy, Welding, Diesel workshop; Marine workshop; Basic Machine Shop; Applied Mechanics; Fluid Mechanics or Material Science. Interested and eligible candidates may send their Resume / Curriculum Vitae to the e-mail dradmin.mumbaiport@imu.ac.in on or before 27/07/2018 and report before the Administrative Consultant, IMU-Mumbai Port Campus, LBS CAMSAR & MERI, Hay Bunder Road, Mumbai-400033 on 31/07/2018 between 10:00 hrs to 16:00 hrs along with their detailed Resume / Curriculum Vitae (with passport size photograph) and original Certificates / Testimonials, self-attested copies of all relevant documents regarding educational & work experience. Indian Maritime University (IMU) Chennai invites applications from eligible and interested candidates for direct recruitment of following Non-Teaching positions. The closing date for submission of online applications is 23rd May 2018. Deputy Registrar –> Post Graduate with at least 55% marks or its equivalent grade of 'B' in the UGC prescribed 7 point scales. At least 07 years experience in specified institutions. Assistant Registrar –> Post Graduate with at least 55% marks or its equivalent grade. At least 03 years of relevant administrative experience. Section Officer –> A Bachelor's Degree. Working knowledge of Information and Communication Technology. At least 05 years work experience. How to Apply: The application shall be submitted only through the Online mode only. The last date for submission of Applications through Online mode is 23/05/2018 up to 11:59 PM. Indian Maritime University (IMU) Chennai is looking for Campus Directors for its various Campuses presently located at Chennai, Mumbai Port, Navi Mumbai, Cochin, Vishakhapatnam and Kolkata. Eligible Indian nationals apply within 45 days from the date of publication in Employment News Paper dated 17-23 March 2018 Issue. How to Apply: Applications, along with all the requisite documents must be submitted by post only (Speed / Registered). The Duly filled & completed application forms to be sent to “The Registrar, Indian Maritime University, Headquarters, East Coast Road, Semmencherry, Sholinganallur (PO), Chennai – 600119”. Apply within 45 days from the date of advertisement (i.e. Last date will be 30/04/2018). Indian Maritime University (IMU) Chennai invites applications from eligible candidates for Faculty posts in IMU. The last date for submission of online applications is 8th March 2017. How to Apply: Eligible Interested candidates should Apply only Online. The last date for submission of online applications is 08/03/2017 (Wednesday) up to 5:00 PM. Indian Maritime University (IMU) Chennai invites online applications from eligible candidates for vacancy position of Assistant Registrar (Finance), Private Secretary, Assistant (Finance) and Assistant on Direct Recruitment basis (except in the case of Assistant Registrar (Finance), where applications from Deputationists are also invited). The closing date for submission of online applications is 8th March 2017. About: Indian Maritime University - A Central University under the Ministry of Shipping, Government of India. (1) A Master’s Degree in Commerce with at least 55% marks or its equivalent grade or a Bachelor’s Degree with CA/ICWA; the degree should be from a recognized University. (2) At least three years of experience in an office in the Finance and Accounts wing. (2) Shorthand Higher/ Senior Grade in English [120 words per minute]. (3) Typewriting Higher/ Senior Grade in English [45 words per minute]. (4) Proficiency in Information & Communication Technology. (1) A Bachelor’s Degree from a recognized University with a minimum aggregate of 50% marks or its equivalent grade in Commerce or Mathematics or Statistics. (2) Desirable - Working knowledge of Information & Communication Technology, particularly in Accounting Software. (1) A Bachelor’s Degree from a recognized University with a minimum of 50% of marks or its equivalent grade. (2) Desirable - Working knowledge of Information & Communication Technology. (1) For Assistant Registrar (Finance) will be done through an Online Screening Test followed by an Interview. (2) For Private Secretaries will be done through an Online Screening Test followed by Skill Tests in Typing and Shorthand. There will be no Interview. (3) For Assistants/ Assistants (Finance) posts will be done through an Online Screening Test. There will be no Interview. How to Apply: Eligible candidates should apply only Online through IMU Official Website. The last date for submission of Online Application is 08/03/2017 (Wednesday). For any queries, email to crt2017@imu.ac.in.